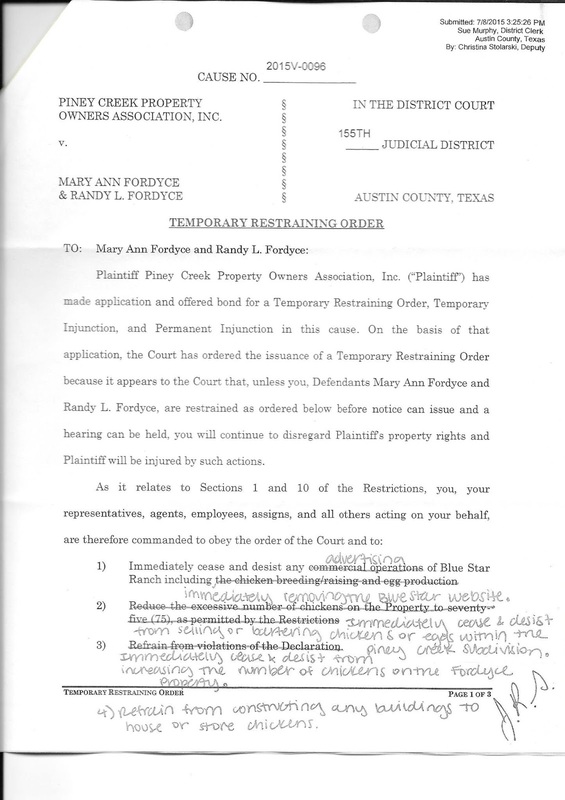 Real Estate Bellville Texas : Disabled Grandmother Stands Ground In Epic HOA Battle To Teach The Masses - Document Release! Disabled Grandmother Stands Ground In Epic HOA Battle To Teach The Masses - Document Release! LEGAL NOTICE: The Authors specifically invoke the First Amendment rights of freedom of speech and of the press, without prejudice, on this website. The information posted on this website is published for informational purposes only under the rights guaranteed by the First Amendment of the Constitution for the United States of America. It is my constitutional right to express my thoughts on this blog. This blog is made up of facts and opinion and my goal is to bring awareness to homeowners to beware of out of control HOA's that lurk in your neighborhood. This case of harassment is one of thousands happening to homeowners all over AMERIKA at this time. Keep all documentation between you and your HOA for your records. Here are a few pages of documents that I am releasing. I have compiled a few legal documents to release to the public. (yes its legal for me to do this) See REAL documents from REAL people in a court of law. My motivations for writing these blogs are to warn potential home buyers to be careful when selecting a neighborhood. Know your HOA BEFORE you make a large purchase. Seek legal information background on your HOA by asking residents in the neighborhood if the HOA is reasonable or has too many lawsuits. Before you choose to purchase a property in the Piney Creek area of Bellville Texas, think again! The HOA changed the laws and rules to single me and my family out. They can do the same thing to you! The HOA in Piney Creek changed the laws and rules again and again to single me out and until they shut down my business, caused the foreclosure of my home and ruined my life. I will NOT be censored and tell my story about this shameful abuse everywhere. This is my constitutional right! Until you are abused by your HOA you won't do anything. One day your family may receive a "letter in the mail" from your HOA. That's when your legal nightmares begin. You'll to do something then. Start taking steps NOW. I have just been informed that HOA's will soon be subject to crimes for their actions. Some states are now changing the laws to make stalking and abuse from HOA's a CRIME, sadly it did not come in time for our family or this group of unbalanced (in my opinion) people in the Piney Creek association for homeowners would have been indicted for their crimes! (again in my opinion) But its a FACT that states are now making laws tp protect homeowners from criminal HOA's! I personally believe the phrase "domestic terrorists" are a good way to describe these groups. They terrorize you in your own home! Did you know that when you purchase homes with HOA's there is legal language within that can take away your home? You are giving away your RIGHTS to the property that you want to purchase to people that you will not know anything about. I know enough to know that I have been done wrong and that there should be rules, regulations and guidelines to become "watchman" over the antics of Homeowner Associations. Further there should be a Bill Of Rights that the HOA must sign and agree to not over step normal bounds. The REAL professionals that know much more about HOA laws are HOA Reform Coalition Of Texas and On The Commons Radio Show where I was a guest speaker on HOA abuse. You may want to consider to review this information BEFORE making a purchase of a home in an HOA controlled area. Also, people that live in HOA's NOW in my opinion I would suggest that one or more homeowners form a committee and make a Facebook Community page for your neighborhood. Not only will it get neighbors talking with one another, you can keep you HOA in check and you can report on any harassing HOA activity ASAP in your neighborhood. Really? By Who's Authority Can An HOA Shut Down A Website? Please share this blog and this story. You very well may be helping your own future! Over the course of the last 8 years many of my neighbors and then friends turned away in silence not "wanting to get involved" with this HOA problem. Actually there were a few kind souls in the area that tried to encourage us along the way as things imploded. They too dissipated. What do I want? What am I trying to accomplish? I ask myself this each and every day. I'm rebuilding my life all over again when I should be planning my Golden Years, I am starting all over! at my age! I want to be heard. I want anyone and everyone to know that what happened to me and my family can happen to your family too in a second. When I realizes how out of control these people were I had to take a stand! Pretty much I am a strong person, but when I feel that my family is threatened by these actions my "mother instinct" kicks in to make me stand and fight. These blogs ( and all of their copies, news documentaries, videos, photos, release of documents, audio and all) are my right to share these legal cases. All of the information that I or my marketing companies publish are to warn people about abusive HOA's and to know your rights. All of this information will forever stay posted on the Internet, Blogs, Videos and Social Media. The information about abusive HOA's will be on their permanent record. THEIR PERMANENT RECORD! But I do not want this disaster to happen to anyone. This is the reason that I MUST speak out! This is why new laws MUST be made. We all know that this is not the same America that we grew up in 40 or 50 years ago. People are speaking out everywhere against injustice. I cannot KEEP SILENT anymore. Neither should you! So even though I am a quiet reclusive type yet I feel compelled to speak out against injustice. This is all WRONG. All I wanted was to be left alone to have chickens as a small business in my backyard. My family was violated and hurt, we lost all that we had due to a few "board members" of a homeowners association in Bellville Texas (Piney Creek subdivision to be exact. They would not allow a zone variance in our chicken coop. My chicken coop was four FEET from the boundary line of our business being inside of the Piney Creek property. For eight long years we battled in the courts until my business was shut down and we lost our home to foreclosure. Gleefully that thought that it was over.... But now I'm bbaaccccckkkk! Is This How You Want Your HOA Money Spent? My crime? running a chicken business in my backyard acres away from my neighbors that sold cattle and horses. It did NOT escape a Federal Judge that one of the board members Kathy Hayward ( a secretary on the board at the time) actually made the complaint about my chicken coop, she lived a mile away and she has a website http://www.countrychickens.com/ (since shut down I wonder why?) where she bought and sold chickens and fertile eggs! and she was on the board and Kathy was running her business from her home and in fact had actually sold me eggs and chickens!.... but I was not allowed to have a business, Why? Larry Ray Dawson and his wife Denise Dawson had a gift basket company where they sold gift baskets to the neighbors. Larry Ray Dawson was the then President of the Homeowners Association in Piney Creek Bellville Texas. But I was not allowed to have my business Why? 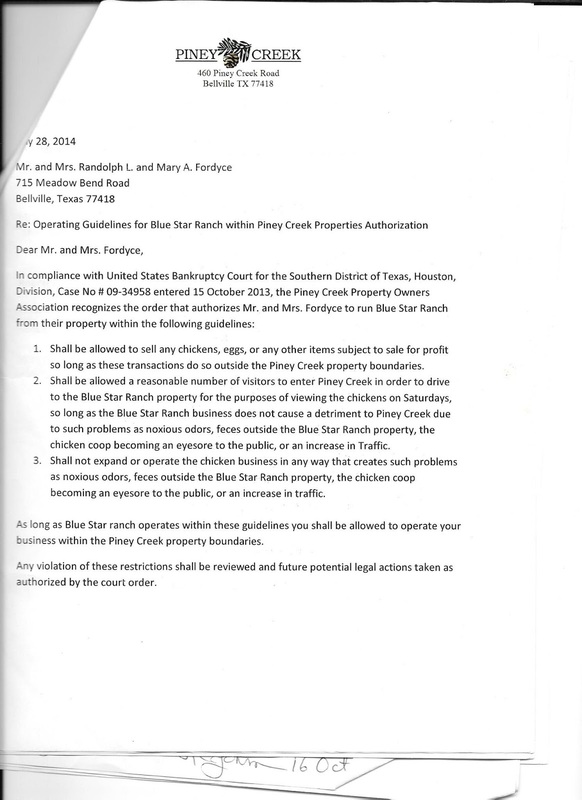 Larry Ray Dawson filed false charges against my company with the TCEQ after never having even set foot on our property. Why? And on and on.... There is not the need to re-hash eight long years of these unjust events. 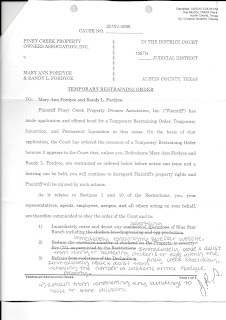 It nearly amuses me at this point, now that I have left the actual area of Bellville Texas if Judy Manning (President/Secretary/Treasure and all other titles that she gives herself) if she is devising a way to spend more than the $100,000 that she has already used from the accounts of the Piney Creek account? To date this "HOA" have used funds of over $100,000, hired 8 law firms, 13 attorneys and harassed me for 8 years of my LIFE to close my chicken coop. Really? Will Judy Manning and her board of directors spend more money now in a civil suit to stop me from telling the truth? How will the homeowners in Piney Creek subdivision react? When they know how that this HUGE sum of money has been used unjustly and was this money spent approved by the homeowners? I think not. In my opinion, Judy Manning, Bill Manning, Jimmie Byrd, Barbara Byrd, Bob Johnson and all of the rest of them likely did not ask the homeowners to what limits should they spend this kind of money. one. Thinking that I was all alone it this world and now I find that there are thousands of homeowners just like me suffering just to avoid problems in a hellish neighbor against neighbor dispute. many homeowners have suffered even worse fates than mine. See links below. Many more blogs and news stories being published daily! 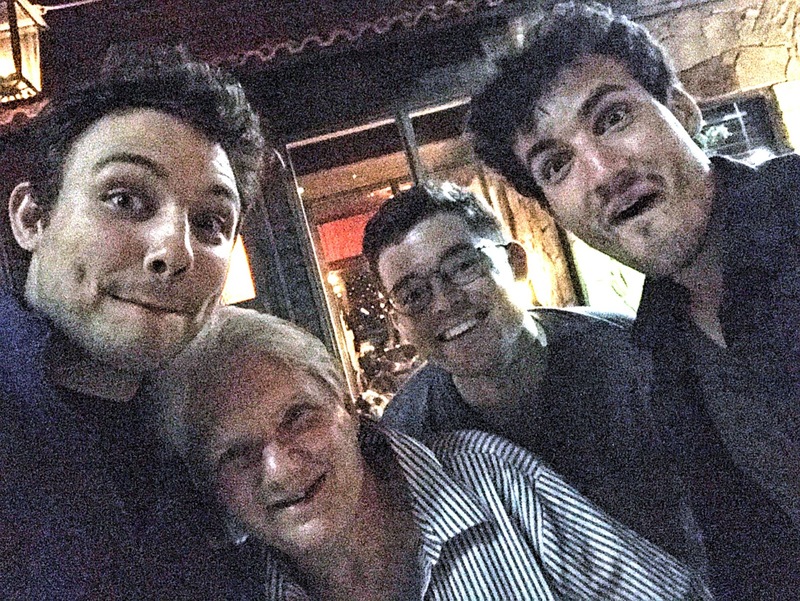 Read this back story and help me to share this story. We are trying to get laws changed forever to protect homeowners from "domestic terrorism" In my opinion. This is what HOA's have become, LEGAL domestic terrorists that can destroy your life and those around you. Note: In over 8 years I have learned a little about the law... I am able to NAME these people in my blog as I am quoting PUBLIC RECORD. (not this is not liable in quoting public record) I am naming these individual that have LIED against me as its proven in a court of law. In my opinion this is despicable behavior coming from adults that are running the Piney Creek community Homeowner Association board! If I still lived In Piney Creek area I would DEMAND an accounting of all funds spent by Judy Manning, Bob Johnson, Barbara Byrd, Jimmie Byrd and the others. 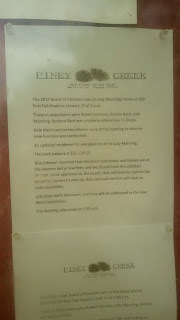 In my opinion they are using the Piney Creek Association funds like their own piggy bank! Where is the accountability? Super Talented Film Journalists - Documenting and Creative Film Techniques. They Have Won Many Awards - Its Possible This Documentary May Be In International Film Festival! HOA Changing Laws / Rules Again Seriously! Here are the exact excerpts of Judge Bohm Decree Case No. 09-34958 that was finalized September 24th 2013. We will gladly assist you in getting you a copy from Harris County Federal court if you need direction to review this case. · The WHOLE truth of this situation should be ultimately examined by the courts and with someone with the authority to create some common sense rules and guidelines or regulations to govern the unrestricted Homeowners Associations. 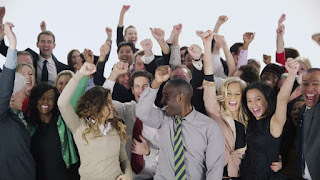 · C-18 No board representatives or board member has ever personally visited the property for the purposes of the investigation of the business. 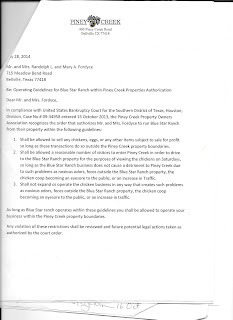 · C-21 On May 27th (the same day as the SENS center meeting) the TCEQ performed a surprise inspection of Blue Star Ranch and found that we passed inspection 100% no chicken droppings, no odor and they concluded that we are using best management practices. 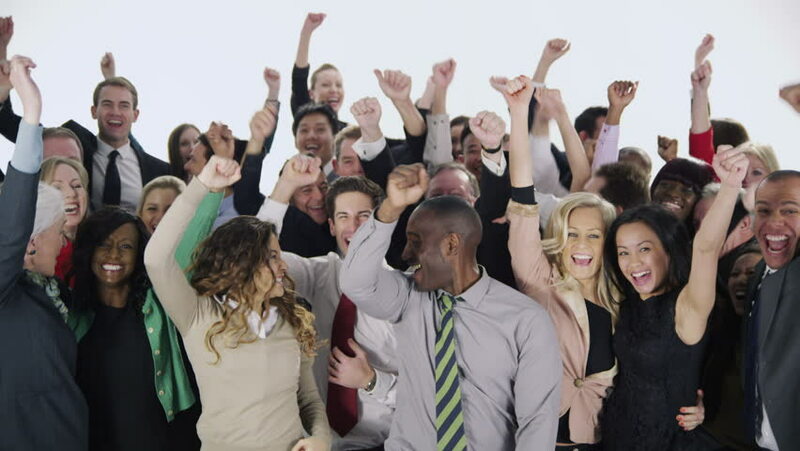 · C-23 The association failed to present ANY evidence that the property values in Piney Creek are due to chicken activities. · D25 Mr. Dawson 2012 board member states that under oath he has no personal knowledge of chicken breeding or egg production on the property. · D24 Ms. Hayward, The secretary on the board of directors, lives at least a mile from the property and has no personal knowledge of any noxious odors or increased in traffic due to activities and she based her complaint solely acquired from reading our website. (she stated this under oath) NOTE- THIS IS THE ONLY ACTUAL COMPLAINT AND SHE LIVES OVER ONE MILE AWAY FROM MY HOUSE. · D26 Mr. Dawson has never detected any noxious odors coming from the property. · E28 ether property owners in Piney Creek operate businesses from their homes with the intent to make a profit. The association is aware of multiple property owners in Piney Creek that sell chickens, eggs and livestock including cattle. · Other Piney Creek residents including Ms. Hayward, Also raise and sell chickens and maintain chicken coops. 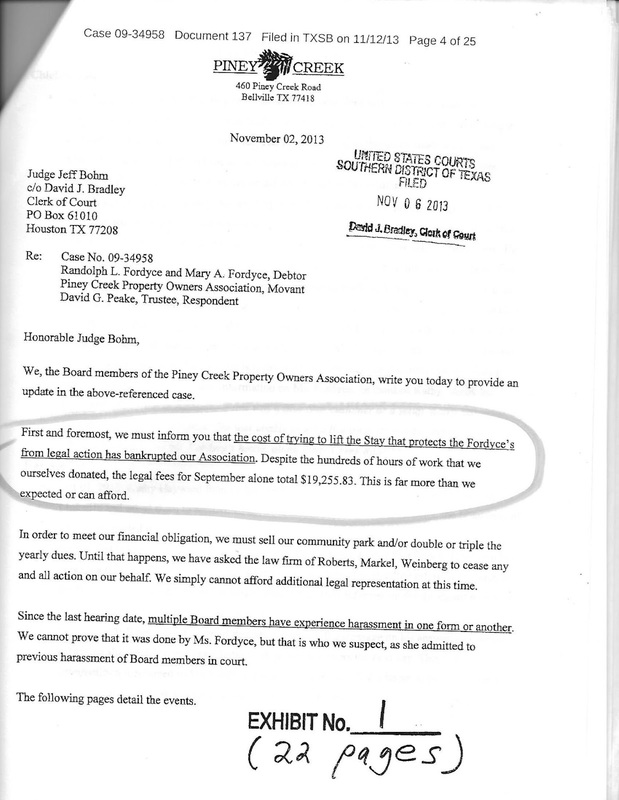 · JUDGE BOHM STATES: In sum after reviewing the entire record and applying “totality of the circumstances” test this court finds that in the preponderance of the evidence shows that the association’s exercise of its authority has been arbitrary, capricious and discriminatory toward the Fordyce’s. The judge based his findings ruled that no attorney’s fees were to be awarded to the association. Maybe you will not have problems from your HOA. Do you know someone as a friend or neighbor and you get special treatment? 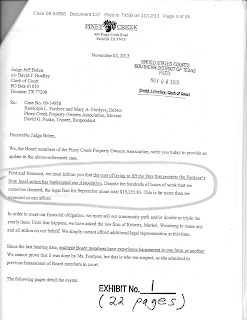 This is an actual court case and a FEDERAL judge ruled against this HOA in Piney Creek Bellville Texas. We are filing a TV show for cable TV. I'm posting blogs, websites, recording news media and REALLY trying to get this case noticed so that one day new laws can be made. the important thing: There are THOUSANDS of people like me out there with legal troubles, they may not be able to do anything about it. Everyone SPEAK UP! Well, I bet the HOA did not "see that coming." I'm seeking a way to rent a satellite in outer space to beam this story to other galleries (partial sarcasm with smirk on face!) At least I'm not mad... if I was I'd really start promoting this story. Post job ads for social media experts on Monster & Indeed or other job boards. Do not underestimate the power of Social Media! Pay a few dollars to teenagers with computers will get you lots of postings! Post your story on Facebook & Yahoo/Google Groups forums Seek legal advise. Its out there you just have to look for it. The ONE thing HOA's do not want to be is visible to the public. Bring your HOA to the light and tell everyone on your Facebook, Twitter and other social media what your HOA is up to. What has your HOA done to you? Post videos and slide shows about HOA abuse and the unfair things that they are doing to you. Be sure to state "in my opinion" when speaking or writing about your individual case to avoid slander/liable charges. So tell what they have done to you and your fellow neighbors. Let it be known on social media that your HOA's are unfair and need to be controlled with regulations and rules. Join the sweeping movement! property listings for homes for sale in Bellville.